This is our most popular vanity from the Fresca line. Marble, real wood and ceramic make up this stunning piece usually installed in high end residences. Double sinks make this perfect for a master bedroom, his and hers with equal amount of drawer space. The UNS model features sunken sinks rather than vessel bowls. Very clean lines, no fuss, no extra frills make it easy for the homeowner to then spice up the rest of the bathroom. Maximize your counter space and show off your style with the cutler kitchen &. Bath silhouette 48 in. Wall hung bathroom vanity. 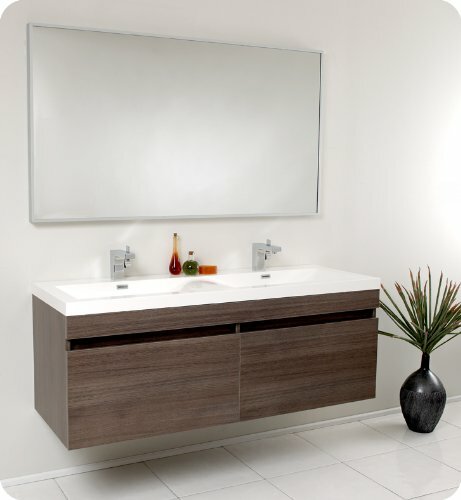 Featuring two cabinets and two drawers, this modern floating vanity boasts European soft closing hardware and sleek chrome hardware. The smooth acrylic top is fitted with an overflow and has a single cutout for a faucet. The entire vanity secures safely to wall studs with the 3/4 in. Uv coated birch plywood backing. Choose the finish, from available colors, that best suits your individual taste and style. Dimensions: 47.24W x 18.11D x 20H in. Your choice of available finishes. Made from wood. Includes cabinet. Single pre-drilled hole for the faucet. 2 door design. White countertop. Make a bold statement with the Cutler Kitchen & Bath Textures 30 in. Wall Hung Bathroom Vanity. 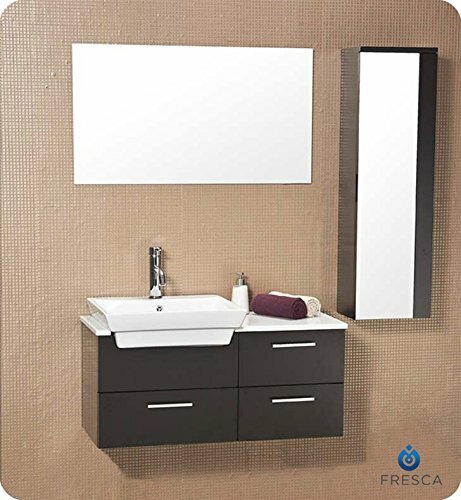 This floating vanity strongly secures to wall studs with the solid 3/4 in. coated birch plywood back. The acrylic top is fitted with an overflow and has a single hole available for a faucet. 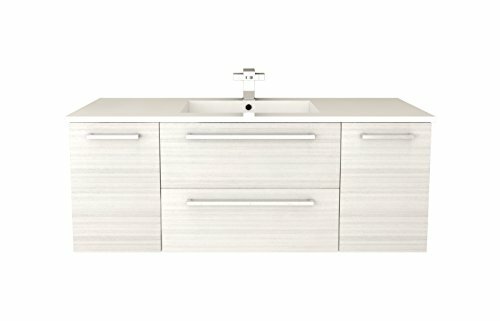 Constructed of wood, this bold vanity is available in your choice of finishes and features a single deep drawer with a brushed chrome pull and European soft closing hardware. Dimensions: 29.53W x 18.11D x 20H in.. Choose from available finishes. Made from wood. Includes cabinet. Single pre-drilled hole for the faucet. Soft closing hinges. Floating installation. 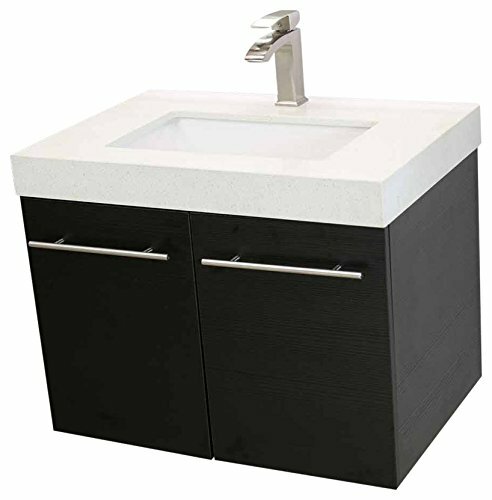 Specifications: Vanity cabinet: * Brand: WindBay * Cabinet height with under-mount sink counter top: 22 3/4" * Depth of cabinet: 20 1/4" * Depth of cabinet w/ counter top: 20 1/2" * Durable finish and easy to maintain. * Upgraded brackets. Construction hurricane grade brackets. * Heavy Duty hydraulic self closing hinges. * Completely finished panels, including edges. * Assembly required. Counter tops: The integrated under-mount top and sink is made from a durable composite of marble stone. Polished in a high durable stain and scratch resistant finish. * Width: 36" * Depth: 20 1/2" Faucet: Our faucets are brass constructed, with a high anti-corrosive chrome/brushed nickel finish, with warrantie ceramic cartridge. * Material: Fully brass constructed * Disc: Ceramic disc * Configuration: One-hole * Finish: chrome or brushed nickel (brushed nickel will be the default. Please contact us after your order, if you would like chrome hardware and faucet). Includes: Sink, counter top, faucet, vanity cabinet, drain, p-trap, and mounting ring if necessary. Specifications: Vanity cabinet: * Brand: WindBay * Cabinet width: 24" * Cabinet height w/o counter top: 19 3/4" * Cabinet height with under-mount sink counter top: 22 3/4" * Depth of cabinet: 20 1/4" * Depth of cabinet w/ counter top: 20 1/2" * Durable finish and easy to maintain. * Upgraded brackets. Construction hurricane grade brackets. * Heavy Duty hydraulic self closing hinges. * Completely finished panels, including edges. * Assembly required. Counter tops: The integrated under-mount top and sink is made from a durable composite of marble stone. Polished in a high durable stain and scratch resistant finish. * Width: 24" * Depth: 20 1/2" Faucet: Our faucets are brass constructed, with a high anti-corrosive chrome/brushed nickel finish, with warrantie ceramic cartridge. * Material: Fully brass constructed * Disc: Ceramic disc * Configuration: One-hole * Finish: chrome or brushed nickel (brushed nickel will be the default. Please contact us after your order, if you would like chrome hardware and faucet). Includes: Sink, counter top, faucet, vanity cabinet, drain, p-trap, and mounting ring if necessary. This solid wood ensemble is contemporary and chic in design. This vanity offers a touch of sophistication of white counter top contrasted and a white basin against a dark Espresso finish. Comes with a mirror and an additional storage cabinet. Ideal for anyone looking for a simple yet elegant look. 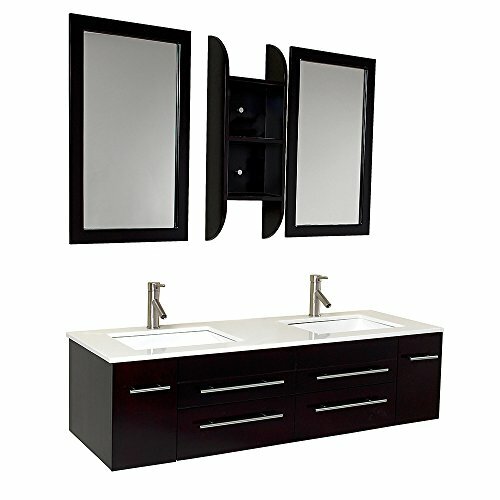 Specifications: Vanity cabinet: * Brand: WindBay * Cabinet width: 30" * Cabinet height w/o counter top: 19 3/4" * Cabinet height with under-mount sink counter top: 22 3/4" * Depth of cabinet: 20 1/4" * Depth of cabinet w/ counter top: 20 1/2" * Durable finish and easy to maintain. * Upgraded brackets. Construction hurricane grade brackets. * Heavy Duty hydraulic self closing hinges. * Completely finished panels, including edges. * Assembly required. Counter tops: The integrated under-mount top and sink is made from a durable composite of marble stone. Polished in a high durable stain and scratch resistant finish. * Width: 30" * Depth: 20 1/2" Faucet: Our faucets are brass constructed, with a high anti-corrosive chrome/brushed nickel finish, with warrantie ceramic cartridge. * Material: Fully brass constructed * Disc: Ceramic disc * Configuration: One-hole * Finish: chrome or brushed nickel (brushed nickel will be the default. Please contact us after your order, if you would like chrome hardware and faucet). Includes: Sink, counter top, faucet, vanity cabinet, drain, p-trap, and mounting ring if necessary. The Morenobath Mob 42 in. Wall Mounted Single Sink Bathroom Vanity mounts directly to your wall, giving it a floating appearance that adds sleek style to your space. 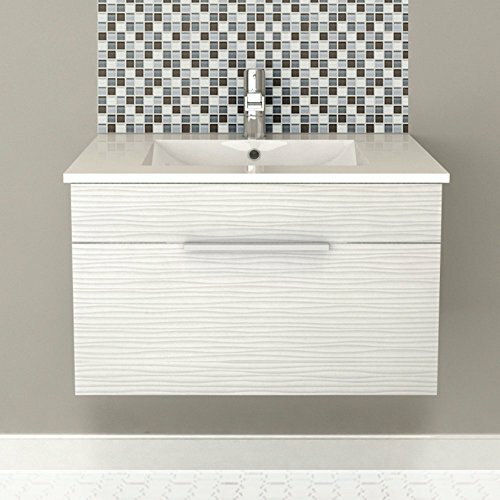 Available in your choice of finishes, this vanity is moisture-proof and waterproof for supreme durability. Two self-closing drawers provide additional storage space for bathroom essentials. Dimensions: 41.5W x 19.75D x 22.5H in.. Choose from available finishes. Built of MDF wood and veneer. Features 1 sink made of reinforced acrylic composite. Contains 1 sink and 2 drawers. Comes with single hole drilled for faucet (not included). Mount on wall. 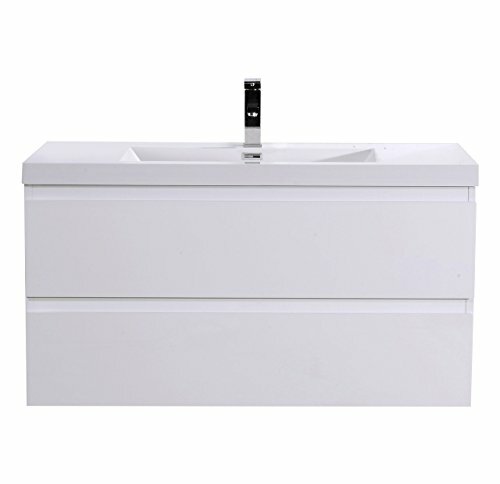 Striking in its simplicity, this double sink vanity offers modern sophistication to your bathroom. It also features uniquely designed chrome faucets and special pull out drawers. Its large sink has a unique wavy bottom for splash of fun. 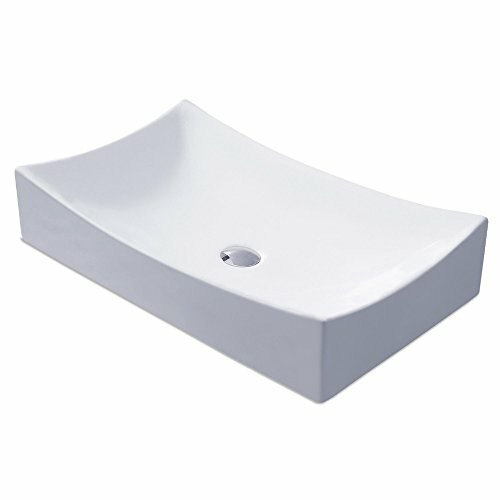 Compare prices on Floating Bath Vanity at ShoppinGent.com – use promo codes and coupons for best offers and deals. Start smart buying with ShoppinGent.com right now and choose your golden price on every purchase.